:) Happy New year to you guys in Canada?!!! Keep up your great work! Im not Canadian, but you'll be happy to know they have a va**na in charge up there. I was among thousands of performers for the opening ceremony of the Commonwealth Games on 4 April 2018 in the Gold Coast, Australia with the Game's tag line as #SHARETHEDREAM . As the man who caused the fire breathers into the opening ceremony of the Sydney Olympic Games (15 September 2000) in the name of WORLD PEACE, the dream I took into the Commonwealth Games was causing WORLD PEACE BY 2020. "PASS IT ON!" and "YOU'RE IT!" are two replies you are most welcome to reply whenever you hear these words SHOUTED OUT LOUD in PUBLIC! 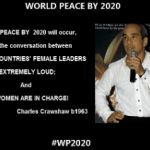 #WP2020 #WORLDPEACEBY2020 See the Ceasefire Project at https://www.youtube.com/watch?v=15GL3GmtUNI&feature=youtu.be?